RIO DE JANEIRO, Nov 21 2018 (IPS) - “We can’t work just to pay the electric bill,” complained José Hilario dos Santos, president of the Residents Association of Morro de Santa Marta, a favela or shantytown embedded in Botafogo, a traditional middle-class neighborhood in Rio de Janeiro. In Santa Marta, 35 people completed a course in electricity and installation of solar panels, and some of them are working in this area today, Drumond said. “The people are our main asset,” he stated. The first facility to benefit was the Mundo Infantil community daycare center, founded in 1983 by local women, with the aim of making it easier for mothers to have a job. Today it serves 60 children from one to four years old, with 13 employees and “occasional volunteers”. The electricity that cost the center about 300 reais (80 dollars) a month dropped to zero several times. “We use the savings to improve the children’s diet,” said director Adriana da Silva, who said the financial contribution she receives from the city government is insufficient. The largest solar installation was set up in another daycare center, CEPAC, in the lower and better urbanised part of Santa Marta, which serves an average of 150 children and is linked to a nearby Catholic primary and secondary school, Santo Inácio. 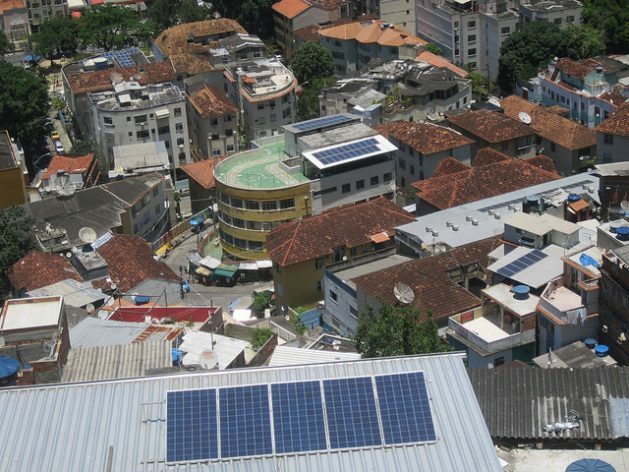 “The electricity bill reached almost 5,000 reais (1,300 dollars) in 2016, then dropped to one-fifth of that,” thanks to solar energy, said Janaina Santos, academic director of the Jesuit educational center, which occupies a five-story building. In that case, the savings were used to expand the library and teaching materials. “The school has become a reference point, it even receives visits from university students. In addition, the environmental issue is important; we take advantage of it to raise children’s awareness about energy and recycling garbage,” she said. 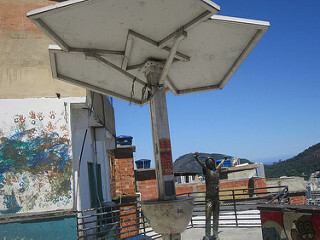 In fact, Santa Marta became a showcase for solar energy. The Morro de Santa Marta Residents Association also obtained a solar panel system that brings savings equivalent to 80 dollars a month, according to its president. Battery-powered units and reflectors illuminate alleys, courtyards and other key locations when the frequent local power outages occur. 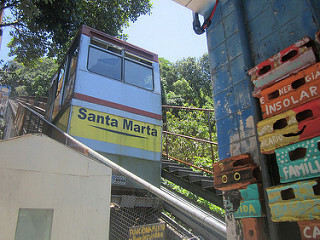 The tram which carries people up the 360-meter hill, where the 4,000 inhabitants of Santa Marta live, also has the emergency solar lighting. Several of these points offer passers-by plugs for charging cell-phone batteries. 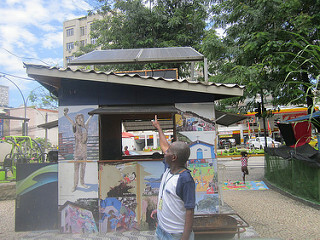 The tourist information stand for people who want to visit the favela only uses energy generated by two solar panels, which is stored in a small battery. The 12 guides who accompany the visitors are residents of Santa Marta who are accredited by the Tourism Ministry. Several of them took the solar panel installation course organised by Insolar. “I offer my services as an electrician,” said one of them, Carlos Barbosa, who is also a hairdresser and environmental activist. 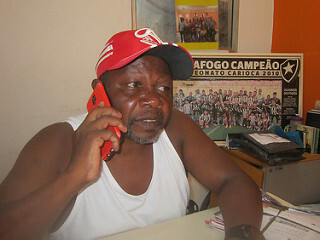 “Each week one of the twelve is in charge of opening the stamd at 8:00 in the morning and guiding the first visit, which can be individual or group,” reported Mandundu Muziala Washiwa, a 50-year-old man from the Democratic Republic of Congo who came to Brazil “to travel” in 2006 and stayed. Then, on a first-come, first-served basis, the guides take turns. They are independent, and earn what the tourists pay them, charging 13 dollars for Brazilians and 40 percent more for foreigners, a fixed but flexible price. A statue of legendary U.S. singer-songwriter Michael Jackson, on a terrace in downtown Santa Marta where he recorded a music video in 1996, is “the main tourist attraction that ensures we have work,” said the Congolese tour guide. “The flow of tourists was strong during the 2014 World Cup and the 2016 Olympic Games, but then the violence in the city grew and demand fell,” lamented Washiwa, who speaks French, which helps him also find jobs in other places. He is designing a project for a tour of downtown Rio de Janeiro showing monuments, buildings and other landmarks of Brazil’s history of slaves brought over from Africa. On the terrace featuring the statue of Jackson, who died in 2009, Andreia Miranda, 38, sells souvenirs of the singer, t-shirts and objects related to pop music in a small shop where she hopes to have solar energy soon. “We pay an absurd price for electricity, more than the rich in the city,” she said, agreeing with the director of the Mundo Infantil day care center. A similar complaint was voiced by Bibiana Ángel, a 35-year-old Colombian immigrant who in 2016 installed a solar system in her hotel in Babilonia, a favela near the famous Copacabana beach, on the south side of Rio de Janeiro. The savings in the electricity bill of about 600 reals (160 dollars) per month, already allowed her to pay back, in just two years, the loan with which she purchased her 12 photovoltaic panels. But the Estrelas Hotel is an environmental project, he said. In addition to solar energy, it uses low-energy lamps and equipment, and grows seedlings in a small nursery that donates the plants or uses them in the hotel garden. It also separates the garbage for recycling, and the recylab le materials are given to Light, which in exchange reduces the electricity bill. A group of local residents are trying to create a cooperative whose goal is to install solar energy in people’s homes, to improve living conditions in the favela. But they are facing difficulties in costs as well as rules of distributed generation.